For sale is a complete set of Soldier of Fortune magazine from 1981. Twelve issues, Jan-Dec., all complete. The magazines are all in good condition given their age, there is some wear to the covers and a few issues show minor crinkling from exposure to dampness. $5 shipping, please email with any questions. 5 random issues of SOF magazine from the early 1980's. CORNER BUMP ON UPPER RIGHT OF COVER. ITEM IS IN VERY GOOD CONDITION. ALL PAGES ARE PRESENT AND INTACT. September 2001 SOF. Pages are mostly crisp and good condition. Soldier of Fortune magazines (Feb 1984) Condition is near mint, as it is ‘new’ old stock. As of initial listing 22 available. We have different months available. If you win multiple items please contact me for shipping cost. Your items will be package as securely as possible! Also if want different shipping let us know we chose that BC it’s the cheapest. Feel free to ask any questions and be sure to check out our other items ! January 1998 SOF. Pages are mostly crisp and very good condition. Selling 25 back issues of Soldier of Fortune Magazine. Dates are from 1981-1990. All are in read condition. Free shipping anywhere in the USA. Nice copy of Soldier of Fortune magazine from May, 1981. Magazine is in good shape with no loose or missing pages. This is a muat for any SOF collector. NO LOCAL PICK UP! AFTER 1 HOUR I ENVOKE MY RIGHT TO NOT ACCEPT CANCELLATIONS. you will get the 7 sof plus the nov 1983 newsweek and the feb 1985 vva veteran paper you see in the pics.look at all the pics and ask any questions you have.will be shipped in a box not an envelope. Long out of print this magazine covered the military, war and in particular, the war in Afghanistan during the Soviet invasion and defeat in the early 1980's, and the Vietnam War along with Special Forces, weapons, self-defense and military operations. Magazine is in good shape with no loose or missing pages. Back of magazine had an ad to support what is now the Taliban. This is a must for any Soldier of Fortune collector. NO LOCAL PICK UP! AFTER 1 HOUR I ENVOKE MY RIGHT TO NOT ACCEPT CANCELLATIONS. Soldier Of Fortune Magazine 1986 Condition is Very Good. Magazine is in excellent condition and looks like it just sat on the shelf (see pics). The pictures are of the actual magazine you will receive and are a good representation of its condition. Here's a nice magazine - SOLDIER OF FORTUNE (December 1983). Great magazines. Items are ‘new’ old stock. 22 available on initial post. Condition is Near mint. If you win multiple items please contact me for shipping cost. Your items will be package as securely as possible! Also if want different shipping let us know we chose that BC it’s the cheapest. Feel free to ask any questions and be sure to check out our other items ! Soldier of Fortune's Combat Weapons ('The Guide to International Military Firepower') 4 issues covering a variety of military topics including hardware, tactics, organizations, etc. Issues include Combat Classic: MG-34. There is writing on the cover. June 2001 SOF. Pages are mostly crisp and very good condition. Front cover does have a small tear on bottom. Bottom right corner is a little ripped on the outside cover. Normal wear for the age. It appears to be in good condition but may have minor signs of wear like creases, tears or stains. Refer to photos for condition and flaws. April 2001 SOF. Pages are mostly crisp and very good condition. Lot 3 SOF soldier of fortune magazine Vintage Feb/79, July/78 and Sept/80. Condition is Very Good. Shipped with USPS Media Mail. March 2001 SOF. Pages are mostly crisp and very good condition. 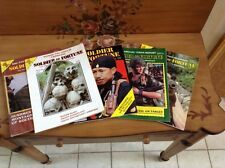 Lot Of 18 Soldier Of Fortune Gung Ho Magazine 1979 1980 1981. Condition is Good. 18 Soldier of Fortune mags from 79-81 and one Gung-Ho mag. They are all in pretty good condition considering their age. Nothing in the inside pages are missing and all in pretty good condition. There are 2 that the covers are detached from the rest of the mag. Those are May and June of 1980. May of 80 is missing the back cover. ITEM IS IN VERY GOOD CONDITION. MINOR EDGE AND CORNER WEAR. CORNER BUMP, UPPER RIGHT ON SCAN. March 1998 SOF. Pages are mostly crisp and very good condition. Vintage Soldier of Fortune magazine August 1981. Lee Marvin On Cover Volume 6 No. 8. It is in Great Vintage Condition, please see photos. Photos are part of description. Shipped with USPS Media Mail. April 1998 SOF. Pages are mostly crisp and very good condition. SOLDIER OF FORTUNE MAGAZINE. JUNE 1979 - PAGES 5 THRU 92. RHODESIAN TERRORIST HIT MAN CONFESSES. OPFOR: THE FRIENDLY ENEMY. ACTIVE & PASSIVE NIGHT VISION WEAPON SIGHTS - DEATH IN THE NIGHT. POLITICAL KIDNAPPING. Your privacy is number one…. Happy Gaming!